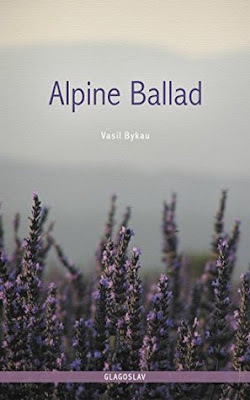 Alpine Ballad by Vasil Bykau is a WWII novel like none I've ever read, before, a story of escape and survival. Near the end of WWII, an Italian girl and a Belarusian soldier escape from a Nazi concentration camp in Austria and run into the surrounding mountains with Germans in pursuit. Both a survival story and a romance, the short novel takes place over a 3-day period. Ivan has lost his shoes and Giulia is wearing clogs. While his feet become unsurprisingly battered, Giulia's clogs slow her down. Ivan considers abandoning her. His new companion is bizarrely, even dangerously cheerful and he doesn't want her to hold him back or give them away. But, he slowly becomes attached to her as they try to find their way to safety and learn to communicate in a hodge-podge of languages cobbled together. Eventually, they fall in love. But, the Nazis are closing in. Through flashbacks, we get to know how Ivan has been imprisoned by the Nazis several times and came to be captured, each time. Through dialogue, we learn Giulia's story. And, in a letter entitled "In lieu of an Epilogue," the reader finds out what happened after the war, a finale that will warm you down to your toes. Highly recommended - Heartbreaking and achingly beautiful, Alpine Ballad is so gripping that I occasionally realized I was holding my breath. It's also an excellent translation. I didn't have any trouble following the story, as I sometimes do with translations, and there are footnotes defining the occasional mixture of non-translated words that are used to show how Ivan and Giulia communicate using a blend of languages. I absolutely loved this book and am going to seek out more of Bykau's writing. You'll have to scroll down to find it, and maybe you'll like some of the other reading challenges as well. Notice on the left sidebar that she lists both WWI and WWII as reading interests. Enjoy! I didn't realize Becky hosts a war reading challenge! Cool. I've done a different one, in the past - War Through the Ages, I think? They had a huge list of WWI, WWII, and Vietnam titles and I did that for a couple years, but I've got quite a list of personal challenges that I set for myself, so I seldom join in on group challenges, anymore.